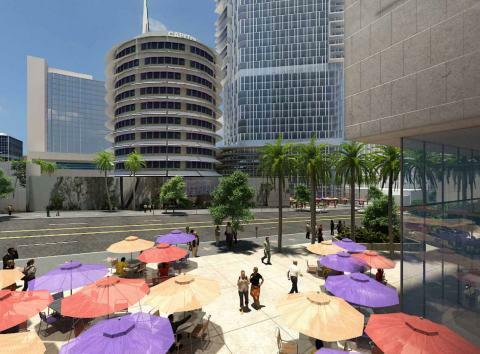 The revitalization of Hollywood continues with a mixed-use development surrounding the Capitol Records Tower at Hollywood and Vine. Millennium Partners, a New York-based firm, aims to build a transit-oriented housing and entertainment center for Angelenos who embrace urban living. TPR sat down with one of Millennium’s founding partner’s, Philip Aarons, to discuss how transit, public space, design, and history play into the Hollywood development. "This project aims to appeal to people who want to be in the city." Describe for us the Millennium-Hollywood development project at Los Angeles' Hollywood and Vine. To give a comprehensive answer, I have to start with the ‘vision’ Millennium has that drives the project. Millennium is a company interested in revitalizing historic downtowns. Unlike many cities around North America, Los Angeles is really a city of neighborhoods with a number of regional centers. 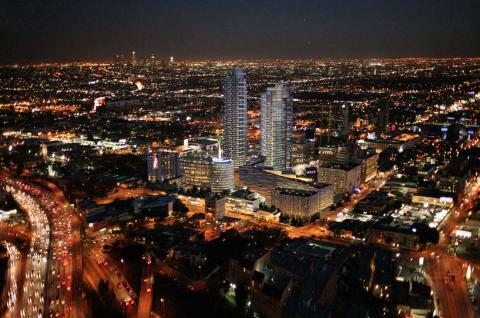 Those regional centers are Downtown, Century City, Westwood and Hollywood itself. Hollywood historically has been where people located for the motion picture business and all of its subsidiary activities, and thus Hollywood and Vine was a downtown in the 1920s. Unlike a city of ranch houses with driveways and pools, Hollywood and Vine is one of the main urban centers for the entire metropolitan Los Angeles area. That became a primary focus for Millennium’s project. We had the opportunity of acquiring a 20th century architectural treasure: the Capitol Records building. It is one of the region’s most iconic buildings, but it’s surrounded by parking lots, both immediately and across the street. You’d say as an urbanist, “How can it be that one of the most famous buildings in Los Angeles has nothing around it to reference or celebrate it?” We, with our partner Argent Ventures, saw our opportunity to preserve the Capitol Records Building as a historic cultural monument for Los Angeles. We’re keeping the tenant, which has an incredible history in that building. They have rights to stay for at least 20 years. Those recording studios are used 24 hours a day, seven days a week. We want to improve what is not considered the best part of Hollywood by making a major investment that will change people’s view of this end of Hollywood Boulevard. There’s been a lot redevelopment at the other end with Hollywood and Highland, with the Kodak Theater where you see every Academy Awards. There’s now a lot of ancillary investment, which is primarily tourist focused. But Hollywood and Vine was really the business part of Hollywood; there were always offices in these buildings. We need to find a way to bring back business, high-level residential, and commercial activities, and we need to stabilize them and encourage them. Millennium Partners wants to make something bold, significant, and transformative. This is what we’ve done elsewhere. In Boston we went into the ‘Combat Zone’ and we built the Ritz Carlton and the Ritz Towers in an area where nobody believed high-end residences would ever flourish. By fostering good uses over bad uses we were able to build a project that remains one of the two or three preeminent residential addresses in Boston. In our view if you can find areas where there is an opportunity to do something great, and to do something significant and bold, then go for it. We benefited from this site being half a block from transit, and if density is going to be absorbed anywhere in Los Angeles, it needs to be where transit is. You need greater density to best manage the region’s growth. But how do you build a project that makes sense in Los Angeles that’s dense and bold and dramatic? You build it next to a subway on a vacant property that displaces no one. All of the components fit together for a project that will be extraordinary. That’s the urbanistic basis for what we are doing. Who do you envision living at the Millennium-Hollywood? The goal of all of our projects is to attract people who embrace an urban lifestyle. We are going to build a building that has rental apartments, condominiums, and a 50,000- to 100,000-square-foot sports club. We’re going to try to make it bicycle friendly so that people can use bikes instead of cars. We envision a young, active population. It’s going to feature great apartments with spectacular views, and there will be tremendous amenities. We’re going to build a small hotel, and that will provide hotel-level services for residents as well as hotel guests. For example, if you feel like having a meal, someone will bring you a meal; if you feel like having your laundry done, someone will pick it up and do it. This project aims to appeal to people who want to be in the city. They don’t want to live behind a gate; they don’t want to live in the hills far away from everyone; they want to be able to walk out their door, walk down the street, go to a restaurant, go to the movies, come home, ride the elevator, look at the Hollywood Sign from their apartment, go to sleep. How important is the Hollywood Metro station to your project? Have you, for example, gone as far as to provide fewer parking spaces for the new development? The transit stop is essential; it provides one of the key attractions. We will build what’s required by the City of Los Angeles as a parking requirement. We’re going to build a far greater number of bicycle storage facilities. We hope to design the sports club so that people can ride bikes or walk to the club, work out, get dressed and ride the Metro, come back at the end of the day, enjoy a drink on one of the plazas, and then go home. This is both for the people who live there and for tourists who come to Hollywood and Vine on the Metro. I hope that they’ll enjoy the restaurants, the shops, and the plazas Maybe they’ll come to Hollywood and Highland, walk down Hollywood Boulevard and take the Red Line home at its next stop. So there’s really a sequence of activities, a route for pilgrimage of tourists. Is the Millennium your first project in the Los Angeles area? Elaborate on your company’s work and your background. This is our very first Los Angeles project. We’ve developed a reputation across the country for doing large-scale, downtown, mixed-use projects. We did them in New York, Boston, San Francisco, Miami, and Washington. We’re a national company. All of our projects have elements of historic preservation; all of them have strong mixed-uses; many of them have a strong transit component. We started in New York by building three buildings above a subway line and participated in the renovation of that station to enhance access to our project and its residential and commercial components. We did the same in San Francisco; we’re adjacent to the BART line in San Francisco. We have a long track record of doing projects at this scale. I come out of an economic development background working for the New York City government; I was the president of the city’s economic development corporation a while ago. I was the founding chairman of the Friends of the High Line and led the effort to transform the abandoned railroad tracks in New York into a public park now serving millions of visitors. There’s a lot of urbanist activities that we’ve long been engaged in. I think that’s part of why Millennium is a good developer for this project. Could you talk about how the Millennium project is being financed? What aid, if any, have you received through government subsidy or tax breaks (for example, maybe through a green initiative or an affordable housing component)? It’s still early in those discussions, but we expect to negotiate for some of those benefits. We plan to have an affordable housing component. We haven’t determined what that is. I feel very strongly about affordable housing components to these projects, and we do them in every case. I can’t say much more than that. In terms of green initiatives, our buildings have been LEED certified. I’d like to continue that here; I’m very eager to take advantage, as I said, of the interrelationship between the transit and the building. You are the founding chair of the Board of Directors of the High Line, a popular public space and a hyper-catalyst for real estate development in Manhattan. How does your experience with the High Line influence the Los Angeles project? The greatest message of the High Line is not directly related to this project. I’m now the chair of the Friends of Hollywood Central Park, which is a planned park that will sit over the submerged part of the 101 freeway. I’m very excited about that project. I believe it will be a catalyst for reintegrating a part of Hollywood that is now really ripped apart by the 101. We’re making some major progress in that effort. I never participated in any of the projects adjacent to the High Line. I did it as a pro bono activity. I don’t really mix my not-for-profit work with my for-profit work. I think this will be, here, a catalyst in one very important way: I think Hollywood needs a major new iconic project to push a lot of other investments. A lot of good projects have stopped because of the real estate recession. I think if we can get this project up and going those projects will move forward and that will be good for Hollywood. I really also believe that if we can do something great at this end of Hollywood Boulevard, as Hollywood and Highland did at the other end, then some of the less desireable uses in the middle of Hollywood Boulevard will be fixed up. I feel strongly that it needs to be addressed and our project will help with that. It’s a famous street and it should look better. It just doesn’t feel right. I think if we have something good at this end, as they do at the other end, then you’ll see some positive and historically appropriate upgrades to the boulevard. The High Line in great part is a success because of landscape architect James Corner and architects Diller Scofidio + Renfro. What can you expect out of the design and architecture for this development? And how are you paying tribute to the historic Capitol Records Tower? We just made the decision to hire James Corner Field Operations and we’re very excited as to the world-class impact that firm will make. They’re very excited about the job and have already come up with some very interesting ideas. The project addresses Capitol Records by creating both place-making towers and public open spaces. It’s too early to talk about the specifics of the design, but we’ve really paid an incredible amount of attention to the pedestrian experience. Again, I believe that the goal of this project is to get people out of their cars, onto their feet, and onto the street. We created on both sides of Vine Street very large, very generous public plazas at grade level, which meant taking on the enormous expense of putting all the parking underground instead of in those customary and hideous above-grade parking garages that block any life on the street. The plazas really are designed to celebrate the Capitol Records and provide a space to enjoy the surrounding urban life. Millennium Hollywood will be a mixed-use complex. How did you settle upon a division of residential, retail, hotel, restaurant, etc.? We haven’t yet. We’re seeking a set of approvals that leaves some of those uses flexible. The project will feature all of those uses, but I can’t tell you today the split of those uses. We do not want to lock ourselves into a set of rigid building designs and uses because the market may not allow for them. We’ve seen people get entitlements through a two- or three-year process only to have the market determine that doesn’t work anymore in a new economic environment, and the project is literally dead. Frequently such developments are sold, and the process starts over again. We’re asking the city to work with us, which they’ve embraced. There may be 300 or 400 apartments. There might be 100,000 or 150,000 square feet of office space. That range is part of what we’re looking at. We’ll make those final decisions as the process evolves and as the project is approved. Where do you see development trending over the next ten years in Los Angeles? I can only say where I’d like to see things go. I’d like to see projects that are thoughtful urbanistically. The Paramount Studio regeneration is a very strong project that should be encouraged. I think more projects around transit, where density can and should go, need to be encouraged by the city. I think there needs to be more growth Downtown; I think there should be more growth in Mid-Wilshire; The Planning Department is definitely working well with developers in acknowledging that this city’s growing, that we can’t just let it sprawl forever, and that we’ve got to focus the energy of developers into these historic regional centers.